How’s that for a clickbait title? tl;dr: You can now do open-peer review on something Quinn Warnick and I wrote, https://digitalpedagogy.commons.mla.org/keywords/failure/. Way, way back in what feels like forever ago—and perhaps it was given my two new jobs since then—I attended the 2012 MLA Convention in Seattle. That convention was notable for a number of things for me, including a panel that I co-organized with Kathi Inman Berens on “Building Digital Humanities in the Undergraduate Classroom”; a talk that I gave on #altac and the digital humanities; and the publication of Debates in the Digital Humanities. Note that I didn’t have anything to do with the latter, but it’s a book that changed the field and Minnesota was kind enough to buy pizza for the small but growing DH contingent at the MLA. Also at that convention, I ended up in a conversation about digital pedagogy and the lack of books on the subject, which was thrown into sharp contrast by the appearance of Debates. The happy result is that in the months that followed I found myself engaged on the advisory board of what eventually became titled, Digital Pedagogy in the Humanities: Concepts, Models, and Experiments. The editors who steered the project—Rebecca Frost Davis, Matthew K. Gold, Katherine D. Harris, and Jentery Sayers—felt that a publication on digital pedagogy probably shouldn’t be limited to print as it simply didn’t respect the medium of the discussion. And fortunately, they were able to place the project with a press that agreed: the Modern Language Association using its tremendous MLA Commons platform. The result will be a book-like publication that is open access and allows for the presentation of original assignments and student work in relation to those assignments. Even early on in the process, the editors knew that they wanted to organize the volume by keywords that were central to digital pedagogy. Those who contributed keywords would curate pedagogical artifacts and materials in relation to their term. 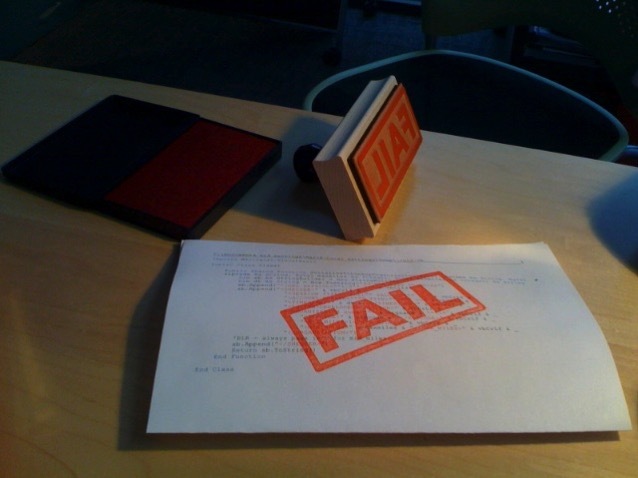 I was both amused and flattered when I was asked by the editorial team to tackle “failure.” It was only a couple of years since I had flailed and failed very publicly in the pursuit of a job and I had since given talks and written articles about failure of one sort or another. It seemed like the FAIL meme had come home to roost and that I should embrace it. Along with articulating how we saw failure working in the classroom, we found assignments or experiences that responded to each of these tiers of failure. We wrote them up and sent it off to our editors. I’m now proud to say that Quinn’s and my keyword has appeared as part of the open review process for Digital Pedagogy in the Humanities. From now until 18 January 2016, you will be able to tell us exactly how well—or how badly—we failed at describing “failure.” (Consider it a Tier 3 exercise!) Please join in the conversation and let us know what you think: https://digitalpedagogy.commons.mla.org/keywords/failure/. That said, I’m happy to get the question and I’m happy that people are willing to ask me. I just worry, as I expressed on Twitter, that my answers just aren’t going to be satisfactory. Again, there’s so much to say and only so much time to respond to such questions. Merisa Martinez responded to me on Twitter and observed that people ask these questions because they’re new and because “there’s no one size fits all ‘FAQ’ with DH.” So people ask those whom they think can help them, and when possible I try to answer as best as I can. But given my conversation with Merisa, I figured I might as well share what I wrote to this interlocutor. It’s not a FAQ per se, but it’s a list of things that people might use to get started with digital humanities. What follows is the text of the email that I wrote to this student. For context sake, he is an MA student who is working with a very good friend of mine from graduate school who now teaches at Illinois State. This friend and I were in different disciplines. The email below has specific recommendations to this individual, but I’ll gloss one of them with a broader rule. I appreciate my friend for referring this student to me and the student for being willing to cold-call someone he doesn’t know and stick out his neck. It’s still true that even with what follows that there is no one-size fits-all FAQ for DH. This is just my response. You’d get a different one from any number of other (smarter) people in the field. See this post by Paige Morgan, for example, which Merisa and Melissa Terras brought to my attention. Or this post by Lisa Spiro which Ryan Cordell reminded me of. You’d probably get a different response from me on another day. As I say below, it can take a long time to start thinking differently with a computer. Too often we forget that we didn’t start studying a particular field on the first day of graduate school. When I started my PhD in English literature, I had been writing about poetry and fiction for well more than 10 years. If you’re in a language program, you’ve got to count not just the literature classes in college, but those language classes in junior high. We live in an awesome age when you can find most things online—including the answer to “what is digital humanities?”—but the time that it takes for us to learn to think in a particular way is real and it can’t be skipped. Thinking, as Mark Sample has it, can be difficult. So here you go, my answer on 25 September 2014 to the “Help, I want to do DH!” email. Thanks for your note. This is a big question and one that isn’t entered into lightly nor, I’m afraid, especially well in an email conversation. Read. Start with Matt Gold’s edited volume, Debates in Digital Humanities. Take a look at Steven Jones’s The Emergence of Digital Humanities. Hunt down all three of Matt Kirschenbaum’s “What is DH?” articles (1, 2, and 3), even though they’re a bit of inside baseball. Look at Digital Humanities Answers. Realize that as far as humanities data analysis goes, there are several different “pillars,” as Elijah Meeks has called them: text analysis; geospatial analysis; network analysis (consider this Coursera course); image analysis; and so on. Get on Twitter and network with people that do digital humanities. It’s where a lot of conversations happen. Think about attending a THATCamp: http://thatcamp.org. Digital humanities is, in the end, still about the same humanities questions. You should start with questions and then choose a method for investigating based on what will help you get the best results. It can take a long time to figure out what those questions are to be paired with computational methods. I’ve been doing this for 7 years, and I’m only starting to figure out what I feel like are some GOOD questions. Think about how long you’ve been working in your discipline and you’ll realize that there’s potentially a long time to be engaged in something before you’ll hit a pay off. None of that is to discourage you so much as a way to say that it’s a big discourse and there’s lots to learn. EDITED: Included Lisa Spiro’s very good post. I’m home for the third snow day in a row, for the second time in as many weeks. The snow is already melting and pretty soon there won’t be anything left of it apart from the trace on our cameras. So it seems appropriate that I take this chance (in between brewing cocoa for the kids and charging batteries) to create a similar trace of a couple of projects that have recently come to fruition. I had hoped to blog about each of these previously, but instead they got quick shout-outs on Twitter. So consider this post and those that follow an overdue announcement or two. Instead, the course continues to be project-based, with a few short essays to contextualize the work that we will be doing in each of the sections. Steve Ramsay is perhaps the patron saint of the class and allowed me to present to the students that the digital humanities is about building (of course) but even more importantly about screwing around (PDF). The projects, I’ve tried to tell the students, aren’t guaranteed to work or to teach us the end-all, be-all about a particular text. But if we get a slightly different perspective thanks to their approach, we will probably learn something. Indeed, I’m contrasting Ramsay’s screwmeneutics with my own preferred definition of digital humanities: computer-assisted pattern recognition followed by interpretation. Hopefully as we play with different texts and tools, we’ll see something new that prompts a need to think differently. As I said, this is an updated course. The field has moved rapidly in the last two and a half years, and I wanted to take some of that into account. This is what is driving the final assignment for the class, in which my students will be digitizing all of Hemingway’s texts and then doing some topic modeling and learning NOT read his work, à la Paul Fyfe and Jason Jones. And I hope to be doing a little bit of social network analysis, even if that just means drawing the networks on the board rather than using a tool like Gephi of NodeXL. All, again, in the service of pattern recognition. And for the first time, ever I’m using a spoke model (pace Boone Gorges) of blogging, where students have to buy their own domains and create everything from scratch. But as far as updates go, I wish that I would have had time to consider more changes than I was able to. I very much believe that there is tremendous pedagogical power in being able to say, “I’ve never done this before. I don’t know if it will work.” And so I’ve been conflicted about any of the repeats that I’m using in the course, including the Mrs. Dalloway project. Of course, my wife has told me that it’s also worth occasionally giving students projects that you know will work, so at least one outcome is good. When I designed my last course, I thanked a number of people whose work directly shaped it. All of those people continue to deserve my good will. But it’s worth calling out a few other individuals who were helpful as I planned this iteration: Ted Underwood and David Mimno were helpful in bouncing around ideas for topic modeling something of an appropriate scale and interest. Stewart Varner was the person who prompted me to stop thinking about Whitman and instead consider someone whose work I knew better. I spent a lot of time looking through Miriam Posner’s recent DH 101 class at UCLA, and asking myself if my course should be more technical. My desire to compete is probably why the students did end up making a domain of their own. Paul Fyfe, again, was an inspiration for the final assignment. But I owe the most to Ryan Cordell. His first “Technologies of Text” syllabus in 2011 (and which he first taught in 2012) was how I decided to emphasize projects in my last class. His newest iteration of that course as well as his graduate seminars continue to inspire me, even as we diverge in important ways in the final product. His influence can be felt in some of my course policies, which I revised this year and even in the choice of URL for the course website, since I realized that distinguishing by semester and year was far easier than trying to write different addresses with variations on “Intro to DH.” My students and I benefit greatly from the generosity of these scholars. The one place I had to draw the line was picking the theme for the blog. Pedagogy might be more about theft than anything else, but one must have some principles. It’s a good theme. Check out the site: http://briancroxall.net/s14dh/. The last time I taught this course, I found it interesting to consider the fact that a 300-level English course intended for majors drew so many from other fields and broke gender norms for English classrooms. So as a parting shot, here are the numbers for this iteration. Although I have 22 students, 10 of them have double majors, which accounts for the total being greater than the number of people in the classroom. 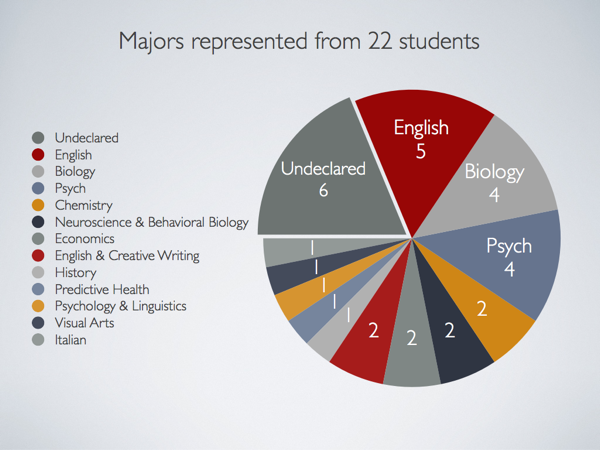 Taking the English and English & Creative Writing students into account, only 7 of the 22 students (or just under 33%) come from the discipline where the course is being offered. I’d like to say that this says something about the appeal of the class (or my teacher evaluations), but it probably has more to do with the class being listed as fulfilling a writing requirement. Perhaps it is also the fulfillment of this writing requirement that is leading to the number of men enrolled in the course. I can say anecdotally that this is a high number for English classes at Emory. 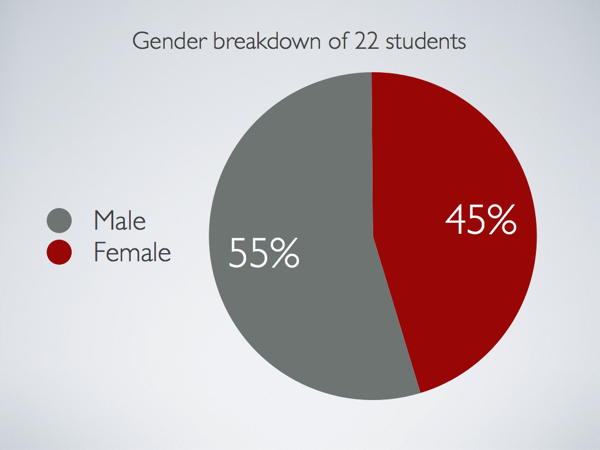 And since the undergraduate student body is 56.1% female, there is real evidence that the ratio here is not what one should expect. This semester I’ve been kept busy not just with the different projects I’m managing at DiSC but with a completely redesigned first-year writing course. In keeping with the other 75% of my work, the class has explored the intersections of literature and technology. We’ve considered the past visions of the future while reading William Gibson’s Neuromancer; the representations of factories in 19th- and 20th-century American fiction and film; and the role intersection of photography and poetry in the amazing Bellocq’s Ophelia by the new US Poet Laureate, Natasha Trethewey. For the last section of the class we are reading Mary Shelley’s classic Frankenstein. And then we’re reading it again, exploring Dave Morris’s interesting adaptation and highly visual retelling of the novel as an iOS app. As we read, we’ll only ask ourselves what it means to retell a story about technology on a completely different device than that for which the story was originally designed. Juxtaposing the two experiences will hopefully help us see how the assumptions of print pervade the world of Victor Frankenstein and how our reading is shaped by the physical nature of the written word. So often, the work of the writing classroom is similarly constrained by the physical nature of the written word. Students are asked to produce papers of a certain number of pages or of a certain number of words. The university requires that the students in these classes produce a total number of pages of writing over the course of a semester. It’s a quantitative approach that treats writing as countable, with arguments subjugated to the realm of the numerical. Not that there’s anything wrong with that, per se. I firmly believe that practicing writing is the best way to get better at it. And practicing per force requires writing frequently and in volume. But it’s also become increasingly important for me to realize that most of my students will never be English majors and that even if they should be, they most likely will not regularly produce essays about literature. I have spent most of the semester teaching them the ropes of college writing, preparing them for the next three and half years (or—to be honest—five years). But now it’s time for them to practice a different form of literacy. For the final assignment in my class, the students will storyboard an interactive experience for Trethewey’s book of poems (click through to see the entire assignment). Working in groups, they will describe how they would combine her poems with the photographs that inspired them, couple them with music, and create a navigation structure. Or how they will refuse to do any of those things. The end result will be for them to again confront the relationship between literature and technology but in this case, they will act as a different sort of author. Still critically engaged, still making an argument, they will nonetheless think about how these acts need not happen in discrete pages or words. That’s the hope, at least. And it suggests a different function of writing or criticism at the present time than either Matthew Arnold or the majority of our teaching has yet to recognize. Next July and the next Digital Humanities Conference might seem very far away (to say nothing of Nebraska), but it turns out that the due date for the call for proposals is right around the corner. Consequently, Kate Singer and I invite 250-word abstracts for a panel on The Future of Undergraduate Digital Humanities. Abstracts are due to the both of us no later than Friday, 26 October 2012. This project grows directly out of our conversation following our poster presentations at this year’s DH Conference. Just in case particular universities’ accounting departments wanted to know if the trip was time and money well spent. With the increasing number of digital humanities job listings, postdoctoral fellowships, and graduate programs as well as the swell in digital pedagogy, it seems an opportune time to think closely about how the digital humanities will shape undergraduate education. New jobs and fellowships presuppose undergraduates who have been and will be introduced to conversations of the digital humanities as well as humanities faculty who will teach them. Because such infrastructures are still very much in flux, the digital humanities in undergraduate education is an area that scholars have only recently made inroads into seriously debating (Brier 2012; Reid 2012; Davis and Alexander 2012). This panel considers how our notions of the digital’s role in the humanities might be recalibrated if we make undergraduate education a more central preoccupation. Building on recent, compelling discussions of infrastructure and curriculum for digital humanities graduate programs (Clement 2010; Thaller et al., 2012; Boggs et al., 2012) as well as roundtables on alternative careers (Nowviskie 2011), dynamic new constellations for undergraduate education are emerging from the interactions among new computational methods, classroom spaces, reimagined curricula, and alternative career paths for college graduates. More than simply creating students to enroll in new graduate programs, introducing the methods of the digital humanities to undergraduates provides opportunities for them to do something traditionally reserved for students in the sciences: original, collaborative research (Blackwell and Martin 2009; Norcia 2008). Working individually or as entire classes, students can experiment with new methods as they are being developed concomitantly by scholars, creating knowledge via new analyses and new approaches. Moreover, digital humanities has arguably brought discussions of pedagogy back to the forefront of academics discussions, with online journals such as Hybrid Pedagogy and The Journal of Interactive Pedagogy and Technology, Brett D. Hirsch’s forthcoming collection Digital Humanities Pedagogy: Practices, Principles, Politics (2012), multiple panels on digital pedagogy at the 2012 MLA (Harris 2012; Berens and Croxall 2012) and a digital pedagogy unconference at the 2013 MLA (Croxall and Koh 2013), Brown’s seminar on TEI and pedagogy (2012), a dedicated track at recent Digital Humanities Summer Institutes (Harris, Sayers, and Jakacki 2012; Jakacki 2013) and several poster presentations at recent Digital Humanities Conferences (Bonsignore et al., 2011; Harris 2011; Singer 2012; Croxall 2012). This roundtable seeks to broaden and deepen current debates about both the role of digital humanities in an undergraduate education and the possibilities for pedagogy, as digital praxis, to alter how we organize and teach undergraduate students. What are best practices for project-based, research approaches in the undergraduate classroom? What are the most important trends and practices in digital pedagogy across disciplines? What departmental / university infrastructure and support are necessary for a digital humanities undergraduate curriculum? Should undergraduate digital humanities work primarily consist of a computational means of studying humanities or a means of studying digital culture? Is digital humanities a methodology or a topic of study? How can the two approaches be best integrated in the undergraduate classroom? How do we integrate both digital humanities as a computational praxis and also digital culture as a topic of study (Reid 2012)? How do we redesign curricula to incorporate both dh courses and incursions into traditional disciplines? How might we envision curricula to be redesigned in the future with digital tools and digital critical thinking in mind? Is digital humanities something that should be based within particular departments? Or is it something that should be taught across all humanities undergraduate departments? How can we prepare students for work at the graduate level? How does digital pedagogy sit under the big tent of digital humanities? Please send proposals of 250 words or less to Kate Singer and Brian Croxall by Friday, 26 October 2012. Alexander, Bryan and Rebecca Frost Davis. “Should Liberal Arts Campuses Do Digital Humanities? Process and Products in the Small College World.” Debates in the Digital Humanities. Minnesota UP, 2012: 368-389. Berens, Kathi Inman, and Brian Croxall. “Session Proposal.” Building Digital Humanities in the Undergraduate Classroom. 28 Nov. 2011. Web. http://www.briancroxall.net/buildingDH/2011/11/28/session-proposal/. 17 Oct. 2012. Blackwell, Christopher and Thomas R. Martin. “Technology, Collaboration, and Undergraduate Research.” Digital Humanities Quarterly 3.1 2009. Web. http://www.digitalhumanities.org/dhq/vol/3/1/index.html. 17 Oct 2012. Boggs, Jeremy, et al. “Realigning Digital Humanities Training: The Praxis Program at the Scholars’ Lab.” Digital Humanities 2012. University of Hamburg. 18 July 2012. Poster presentation. Bonsignore, Beth, et al. “The Arcane Gallery of Gadgetry: A Design Case Study of an Alternate Reality Game.” Digital Humanities 2011. Stanford University. 21 June 2011. Poster presentation. Brier, Stephen. “Where’s the Pedagogy? The Role of Teaching and Learning in the Digital Humanities.” Debates in the Digital Humanities. Minnesota UP, 2012: 350-367. Clement, Tanya. “An Undergraduate Perspective.” Digital Literacy for the Dumbest Generation. Digital Humanities 2010. King’s College London. 8 July 2010. Croxall, Brian. “Courting ‘The World’s Wife’: Original Digital Humanities Research in the Undergraduate Classroom.” Digital Humanities 2012. University of Hamburg. 18 July 2012. Croxall, Brian and Adeline Koh. A Digital Pedagogy Unconference. Modern Language Association Convention. Boston. 3 January 2013. http://www.briancroxall.net/digitalpedagogy/. 17 Oct. 2012. Harris, Katherine D. “Pedagogy & Play: Revising Learning through Digital Humanities.” Digital Humanities 2011. Stanford University. 21 June 2011. Poster presentation. Harris, Katherine D. “Acceptance of Pedagogy & DH MLA 2012.” triproftri. 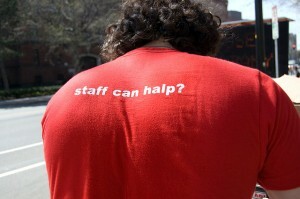 14 May 2011. http://triproftri.wordpress.com/2011/05/14/acceptance-of-pedagogy-dh-mla-2012/. Web. 17 Oct. 2012. Harris, Katherine D., Jentery Sayers, and Diane Jakacki. “Digital Pedagogy in the Humanities.” Digital Humanities Summer Institute. University of Victoria. June 2011 and June 2012. Hirsch, Brett D. Digital Humanities Pedagogy: Practices, Principles and Politics. Open Book Publishers, 2012. Jacacki, Diane. “Digital Pedagogy in the Humanities.” Digital Humanities Summer Institute. University of Victoria. June 2013. Norcia, M. (2008). Out of the Ivory Tower Endlessly Rocking: Collaborating across Disciplines and Professions to Promote Student Learning in the Digital Archive. Pedagogy 8(1): 91-114. Nowviskie, Bethany et al. “The “#alt-ac” Track: Digital Humanists off the Straight and Narrow Path to Tenure.” Digital Humanities 2011. Stanford University. 22 June 2011. Reid, Alexander. “Graduate Education and the Ethics of the Digital Humanities.” Debates in the Digital Humanities. Minnesota UP, 2012: 390-401. Singer, Kate. “The Melesina Trench Project: Markup Vocabularies, Poetics, and Undergraduate Pedagogy.” Digital Humanities 2012. University of Hamburg. 18 July 2012. Thaller, Manfred et al. “Digital Humanities as a University Degree: The Status Quo and Beyond.” Digital Humanities 2012. University of Hamburg. 18 July 2012.